Well the spring card yesterday, didn't help bring spring along. As I am writing this, it has gone dark outside, it's raining and I can hear thunder......to think we have April showers to get through yet! So I thought I would try and brighten the day with a bright orange coloured card. 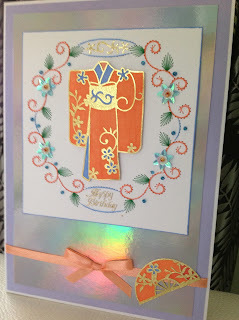 Again, I stitch the pattern while on holiday but when I came to make it into a card, I could not find a topper that would match/blend. I looked though my peel offs and thought I would use this kimono peel off. So I coloured it in orange using my pro markers to match the stitch pattern and the flowers in blue to match the flowers I had sewn on the card. To finish it off I used orange ribbon and a fan peel off, which again I coloured in orange. 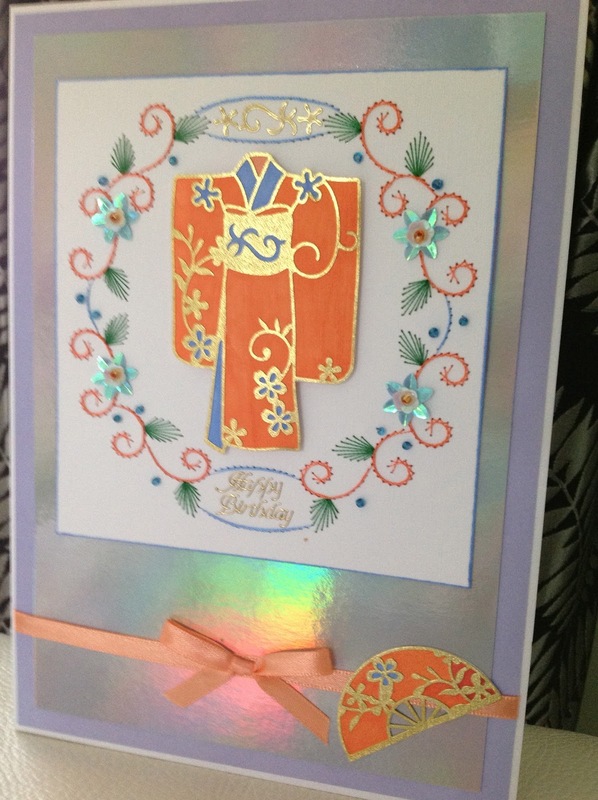 I mounted the card onto to Rainbow mirror card, which reflects the orange colour of the ribbon. Lets hope the weather brightens up, bye for now.